Market Timing Brief for 09-07-2012: SP500 Index Breakout and Metals Gone Mad Based on “Unlimited” Euro Printing! Before we get started I have a thank you. Thank you for making this the number one free market timing newsletter in the world according to Google! It has taken a few years of publishing to get here, but I am very appreciative that you take the time to read the newsletter and frequent the website. Please let me know how I can better serve you via the contact box on the main site at SunAndStormInvesting.com. The SP500 Index has held onto another market timing breakout and now awaits action by the Federal Reserve! 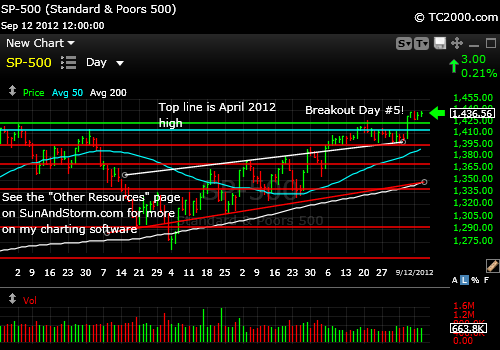 UPDATE 9-12-2012 at 10:14 pm: The market breakout I refer to below has held up now for a full five days. That is very positive. IF the Fed disappoints the market by, for example, taking no action at all, this breakout could collapse. The Fed tends to want to stay in step with the market, so the lack of any action would be a true “left field event.” If that hunch is correct, expect more upside with a potential retest of the SP500 Index 2007 highs before the next pullback. Remember too to watch your stops. Our system involves discipline in protecting principle and profits. I do have one concern and that is the continued sell-off in the 10 Year Treasury Note. If the Fed is going to act tomorrow to provide more easing, then why are treasuries still selling off? They should be rallying. You may not need them, but this is why I would decide on your stops should tomorrow be a big surprise. Last week I felt the SP500 Index (SPX, SPY) was acting toppy; however, the Sun and Storm Investing™ way is to observe what is happening and to respond rather than react to it. This week the SP500 Index came up with the necessary strength to break out to new recent highs over the April 2nd, 2012 high. The reason? The market seems to think the Fed will be as loose as the ECB in Europe given the lousy employment numbers on Friday that were under expectations. The ECB’s Draghi said the Euro (EUR/USD) printing to support the European bond market will be “unlimited.” Thanks for making that clear! I did also say: “Remember that if new highs in the SP500 Index hold, that will erase all the bad technicals. The catch is that sometimes the market takes in the suckers for a day and then pulls the rug, so be sure any new high that is achieved lasts through the 3rd day or so” before committing new money. So far we have 2 days above the prior high. What happened back in 2007 when the SP500 Index went above its high for the year 2000 by ONE day? It reversed the next day. The next upside targets are noted in the text for the above chart. The first of these targets is the 2008 high, which is right above the current level. A VIX volatility index (VIX, VXX) move below 13.30 will verify a further rally of the SP500 Index to the 2007 highs. There are only about 1 to 3 more days left for the VIX to move down before testing the support at the August low. Investor sentiment by AAII shows the Bulls and Bears dead even at 33.06% each and that makes the Spread between the two, ZERO. So with breakouts in the markets and no sentiment bias up or down, that to me is much more supportive of the Bulls than the Bears. The Bulls reached 45.61% back in March 2012 before the market finally started selling off from the 4-2-2012 high, so there is room to the upside for sentiment and the markets. My metal recommendation to buy gold (GLD) has continued to be correct for a second straight week. Silver (SLV) has also been a big winner despite the fact that it insists on bursting up faster than investors can pile on. I added silver on Thursday intraday and then again at the close. When metals jump as much as they are in a single day, they make it hard for investors to climb on board. Make sure to average in to avoid buying a top and losing 5% or more in a few days, which could happen under circumstances discussed at the link below. Last week I also said: “Tell of the week: Watch the US dollar index futures (USDX, UUP, EUR/USD) this week. If the dollar breaks the June and August support levels, stocks will benefit and so will the metals!” The U.S. Dollar index indeed broke down and the metals shot up big time. The CRB index also broke continues strong. Keep buying until the Fed pulls the plug – then watch your stops. Counting all commodities and metals, I now have about 14% of my net worth in “stuff.” If you own real estate, you have a buffer from that as well, since real estate prices are at least more stable to rising depending on the market. This entry was posted in gold, gold etf, investment, Market timing, S&P 500 Index, silver, silver ETF, trading, Treasuries, US Dollar Index, volatility index and tagged gld, gold etf, market timing, slv, sp500 index, spx, spy, tnx, VIX, volatility index. Bookmark the permalink.